Dear international scientists and PhD students, We want to cordially invite you to a boat trip on the Oker river, while we listen to the stories of our guide! Our previous river cruise trip scheduled for the 11 July 2018 had to be postponed, due to bad weather. We rescheduled the trip to Wednesday, 8 August, 2018. This time we are going to merge our river cruise trip with the Summer-Stammtisch at the Okercabana. Date: Wednesday, 8 August 2018. 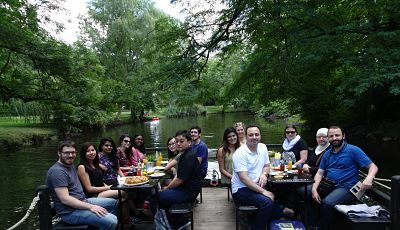 Time: 4:45 pm Meeting Point: At the entrance of the Oker Cabana, Werkstättenweg/Bürgerpark, 38122 Braunschweig If you do not want to participate in the river cruise, you can also come to our regular Stammtisch at 18:30 pm. (Food and drinks at your own expense) It is absolutely necessary to register in advance by e-mail. Please be aware that the registration deadline is on Thursday 2 August 2018. Please be aware that for this event there are a limited number of participants. For registration and questions please send an e-mail to: more@tu-braunschweig.de. Please indicate whether you would like to participate in the river cruise and/or the Stammtisch. We look forward to seeing you there! Best regards, Your MoRe Team TU Braunschweig Please note: Participation takes place at your own risk. Moreover, we may take photographs during our events and activities which may be used in promotional materials, on our website or social networking sites such as Facebook. Please let us know in advance if you are not happy for your photographs to be used for these purposes. By registering for this event, you accept these terms and conditions. Oker Cabana, Werkstättenweg, 38122 Braunschweig. It is absolutely necessary to register in advance by e-mail. Please be aware that the registration deadline is on Thursday 2 August 2018. Please be aware that for this event there are a limited number of participants. For registration and questions please send an e-mail to: more@tu-braunschweig.de. Please indicate whether you would like to participate in the river cruise and/or the Stammtisch.